Since September 9th, Venus has been in Scorpio, minus 4 weeks in November when she backed into Libra for a bit. Scorpio is a Martian based energy with strong overtones of Pluto, quite different from the gentle Venus we are typically familiar with. Venus has been in Scorpio’s boot camp training these past months, toughening up and preparing to face a challenging world. While she’s strong in Scorpio, stronger than usual, it’s the depth of emotion she can go to while she’s here that really resonates. Scorpio is a sign which can be hidden or kept secret, purposefully. Venus in Scorpio, whether by intention or accident, has stumbled across some hidden information during this sojourn and some of it comes right out of a land far away and a time long ago. Think back to the Supreme Court hearings of early October, when Dr. Christine Blasey Ford was giving a gut-wrenching, heart-felt testimony of the pain she’s carried all these years — and the courage she manifested to spill it out to the world. Likewise, Venus in Scorpio brings depth of feeling, courage in the face of fire and the strength to survive life’s sharp and painful edges. 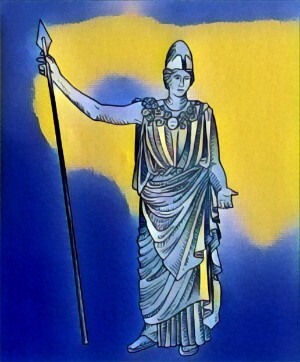 Yet again, it’s not where Venus is at her Venusian best; here she dresses and acts like Mars or maybe Pluto to engage equally on the playing field with her adversaries. 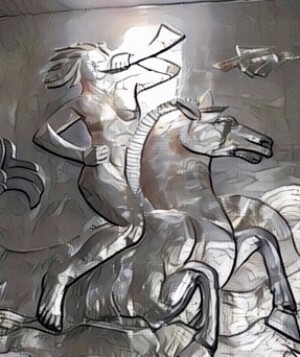 As the new year of 2019 begins, Venus is at 24 degrees of tropical Scorpio and journeying through her final days of this sign. She has just passed over Ceres and the Moon will soon conjoin her. 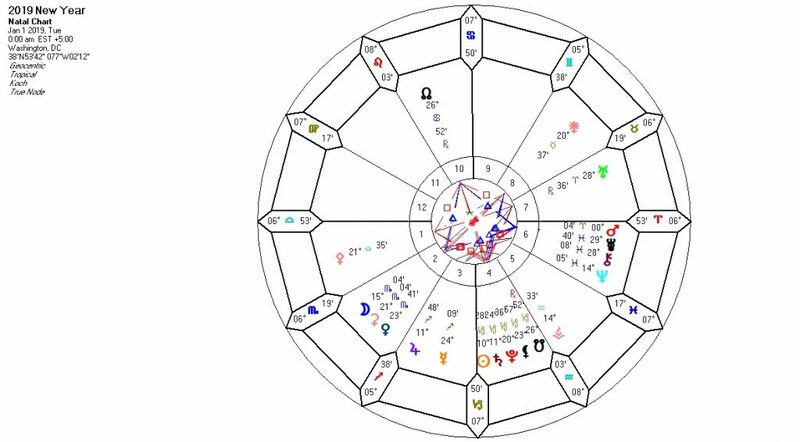 Venus, Moon, Ceres — this triple goddess configuration in Scorpio has something very important to say about the nature of 2019. Something lost and something gained. A realization that it’s time to move on and occupy new ground, but certainly a time to be very respectful to the deep inner spaces of feelings that occur to and with those closest to us in our lives. We say goodbye to some while we welcome new ones being born. 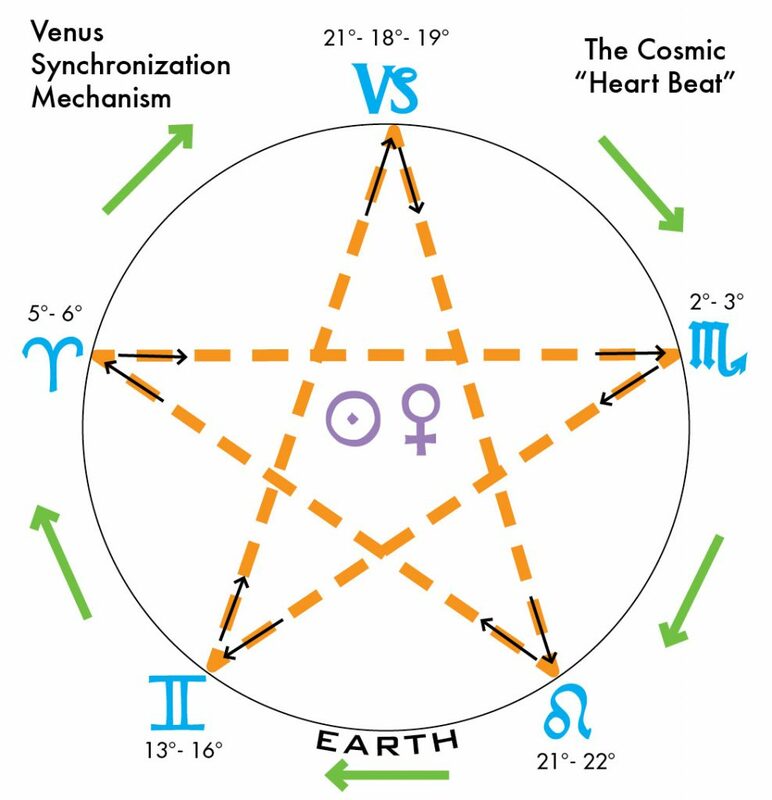 Venus starts the year out with the tying up of the last 4 months and ready to move forward. Then, there’s the Venus Star Point – a unique feature of the orbit of planet Venus. 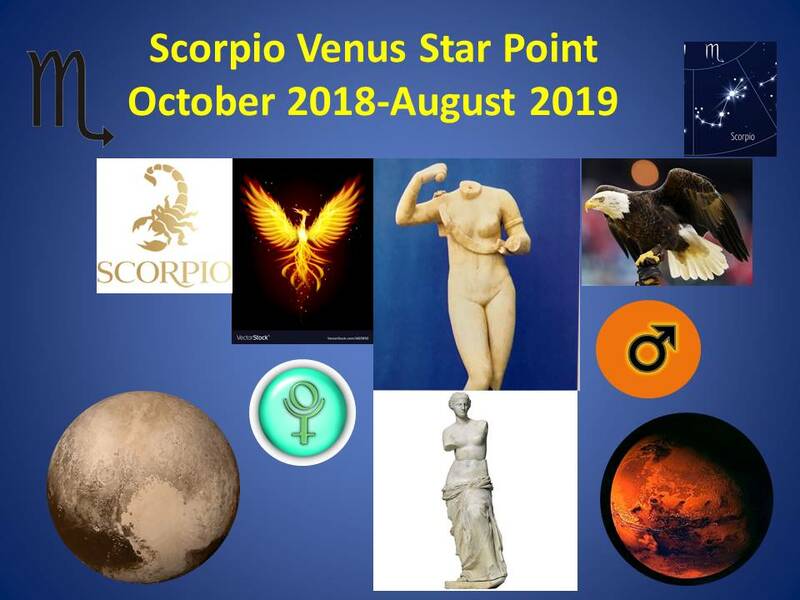 The Venus Star Point begins 2019 in Scorpio where she stays until mid-August so there’s definitely still an underlying Scorpionic feeling to the nature of things as we progress through 2019. Be mindful and trust the good intuition Scorpio is known to bestow. If you are feeling something is amiss, you’re probably right ~ even if your mind tells you not to be concerned. Similarly, if you’re feeling good about something yet edgy and a bit anxious about what it might bring, trust that the good feeling. Pay closer attention to the instincts, the gut reaction… what is it telling you? Act on that. Venus’ final planetary aspect in Scorpio involves her trine to Chiron in late Pisces on the 5th of January. This can be quite an unexpected moment of truth-telling, even an insightful and meaningful dialogue with someone. It might happen quite by accident. You could become involved in a deep conversation with a stranger, and what is revealed and expressed in that moment brings great awareness and healing to both of you. Alternatively, you might revisit a situation from the past, perhaps a wound you’ve been nursing for a very long time, and see it in a new light. The bandages can come off now. There is no more need for personal suffering on this matter as you become aware of how to administer self-care and healing. There is also an awareness that all beings are dealing with their own brand of personal suffering. You can relate, you understand, you feel and you are somehow made whole again from that realization. There is an old adage “it is better to have loved and lost than not to have been loved at all” and it’s like this with the Venus/Chiron interaction yet truly much deeper. What we felt we’d previously lost can now be seen as a gain in experience and wisdom. The 5th of January is loaded, astrologically. In addition to the triple encounter between Venus, Uranus and Chiron, it is the day of a partial solar eclipse, the first eclipse of 2019. With eclipses we always know there is a shadow cast and wonder what delights or frights it will reveal. Then, on the 7th, Venus will finally exit from Scorpio and cross the border into fiery Sagittarius where she will eventually cuddle up close to Jupiter on the 22nd. Her emergence from the water to fire will feel like we feel when we’ve been bathing too long. Venus was said to have been born of the water, from the ocean she came floating to the shore. So, at first, the immersion into a hot tub feels great — it melts away our stiffness and our worries, allowing us to let go deeply and fully. But you know what it’s like when we’ve stayed in the tub far too long. The water has become cold, our skin becomes shriveled, prune-like. We have absorbed too much liquid. Making our way toward the fire will feel good. Sagittarius fire is not solar fire – although in the Southern Hemisphere it probably feels that way about now. However, up in the North, Sagittarius fire signifies lighting a wood-burning stove or fire pit and gathering together to tell some tall tales and spread some cheer. This spirit of a Sagittarian Venus will also inspire you to get off the couch, get outside, hike a new trail or set your sights on scouring the internet for cheap tickets to distant far-off lands. The period of the 18th through the 20th involves Venus with Mars (a yes!) and then with Neptune (I really don’t know how to say no to this!). What we don’t see is the trap it might be setting for us or how what we thought was a giant secret is now public knowledge and everyone is laughing. Watch whether the passion of the moment fires you up to say YES and then contemplate what you’ve really committed to in the aftermath. Perhaps having an emergency exit clause would help. Become aware of how you feel when you retire on the night of January 6th, Venus’ last day in Scorpio for some time, and contrast that with how you feel by day’s end on the 7th. There may even be a dream worth noting which reflects this primal shift from water to fire. Nevertheless, the bottom line is — Venus is in Sag! She’s enjoying herself and enjoying her freedom. Love one another deeply with the love you bring from the long transit through Scorpio, but let your loved ones breathe. Clinginess does NOT work for Venus in Sagittarius. Loosen the reins. Tune into First Friday again — on Feb 1st.